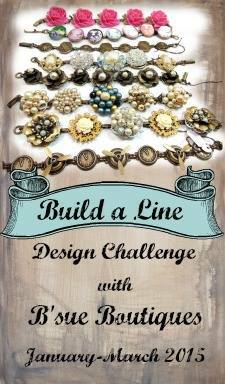 When I read Strega Jewellery’s blog hop announcement back in August, I was intrigued. 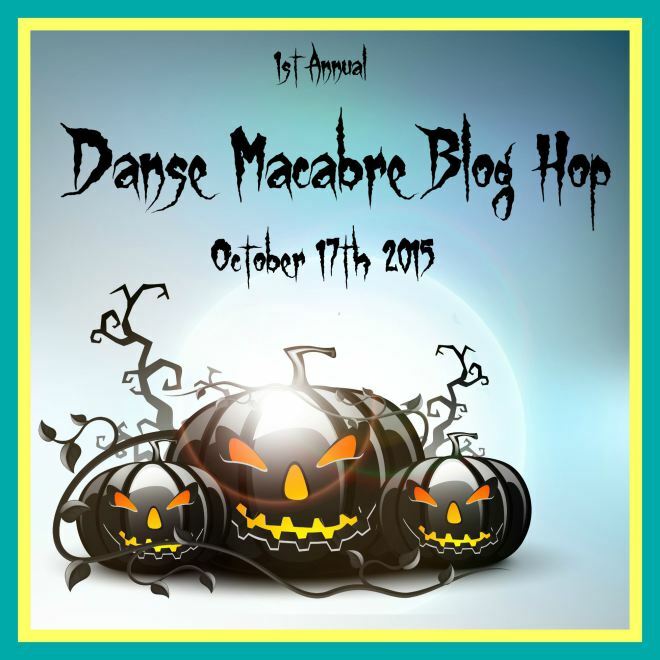 I loved the idea of the Danse Macabre as a celebration of life. The fact that I could make something other than jewelry made it that much better. I primarily make jewelry, but I enjoy branching out from time to time to see what else I can do. 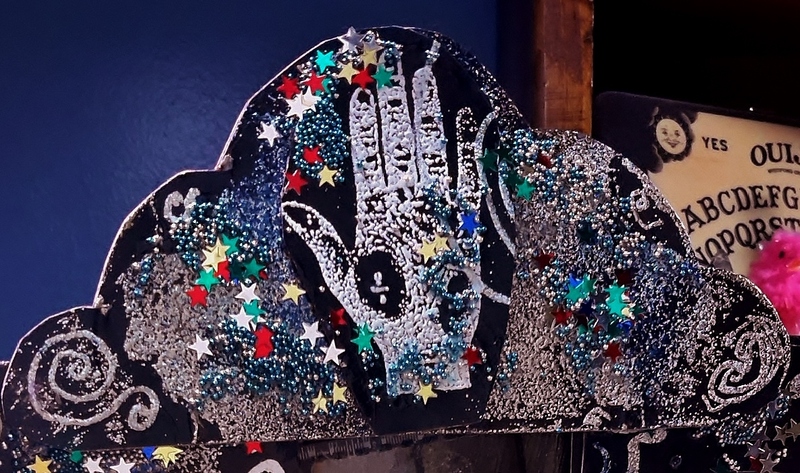 In this case, I knew I would make something that was not jewelry, and would incorporate Dia de los Muertos symbolism. 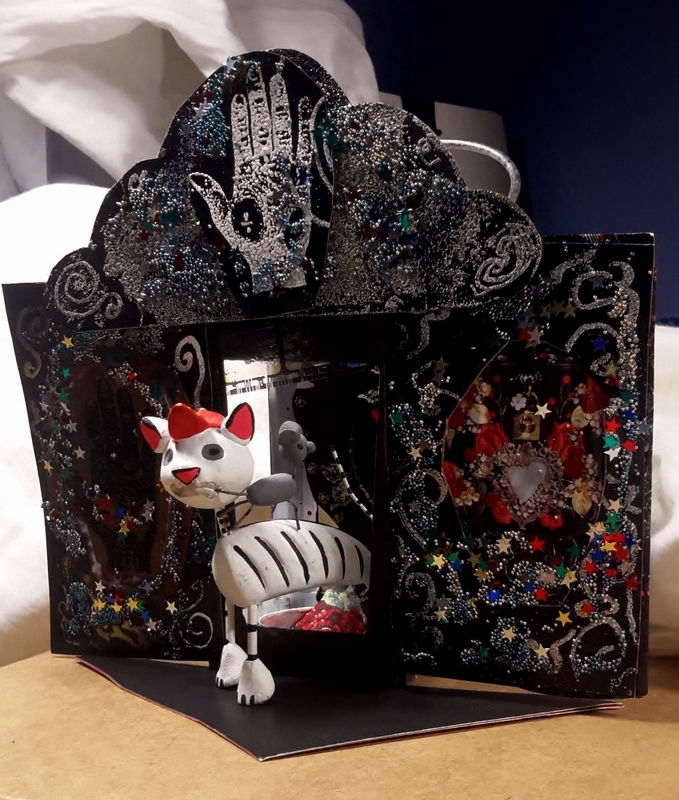 It took some thinking, but finally I remembered an assemblage project that I had set aside, titled “An Easier Way to Make a ‘Tin’ Nicho” by Deedee Hampton from the Sept/Oct 2014 issue of ClothPaperScissors magazine. 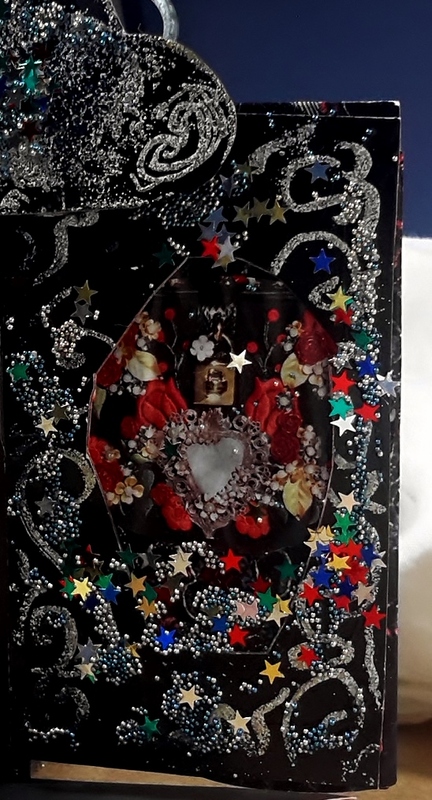 A nicho is a small three dimensional shadow box that is traditionally used for Day of the Dead altars; often using religious imagery or photos of loved ones who have passed on. The imagery and symbolism of Dia de los Muertos has always interested me. I like the idea of creating ways to acknowledge those who are no longer with us, and I love the bright colors and juxtaposition within the art itself. Lately I’ve been working on modifying my projects to fit with what I have on hand, instead of adding to my already over-sized stash of crafting and jewelry supplies. In this case, the project called for using aluminum sheeting, but I decided to use card-stock and collage elements instead. 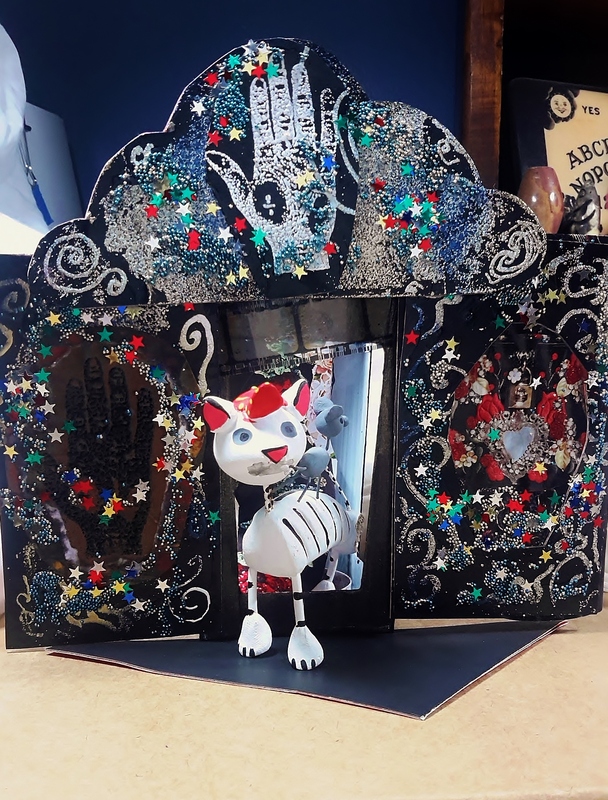 I embellished the nicho using rubber stamps and embossing powder, added some metallic micro-beads and tiny foil stars, and completed the project by setting a Day of the Dead cat and mouse figurine into the shadowbox. Thank you for checking out my blog hop post, and please be sure to view and comment on the blogs of my fellow participants! ← And I’m back… Just in time to blog hop! 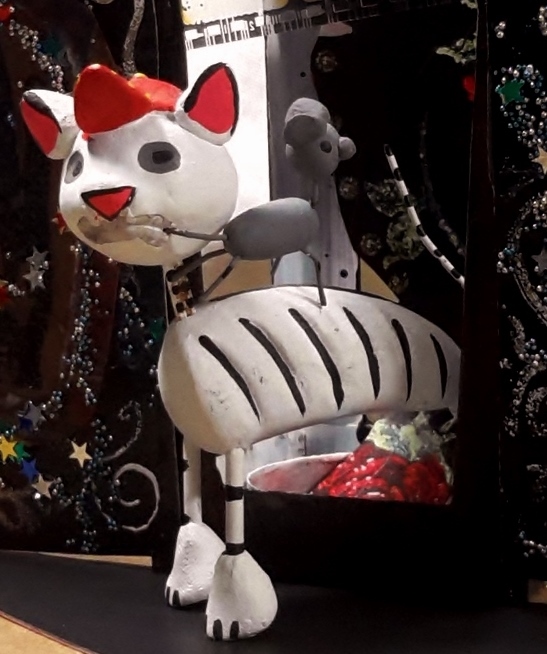 I absolutely adore your nicho, the stamping looks wonderful but your cat and mouse steal the show, adorable! Wow! thank you, Sam W 🙂 I’m so glad that you liked it. This is stunning! So many details and colours ♥ you worked with beautiful materials in a great way. It’s very special, love it! Oh, my gosh, this is an amazing piece! I really like this idea and will have to read more about it. Thanks for sharing the info! You did a fantastic job! Thank you so much – I have plans to make more of these with different themes!